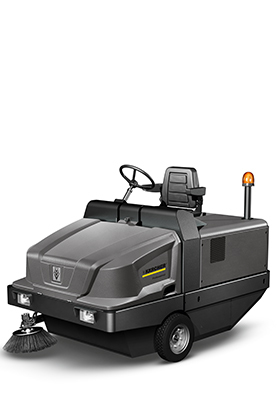 The KM 70/15 C stands out due to the 2-wheels driven main roller brush. The advantages of this concept are especially the good straight forward drive and the sweeping result when driving a curve. Even when there is only one wheel driven in close curves, the main roller brush works constant wich leads to an outstanding sweeping result. This agil machine sweeps good in right curves as well as in left curves. The height of the side brush is adjustable in four steps. The only 20 kg weighty machine works with the dustpan principle: With little pushing force the dirt is transported in driving direction into the 40 l dirt container wich is in front of the main roller brush. On free areas the side brush can be lifted off the ground. This way you can avoid largely unwished dust turbolences. The dirt container is with an ergonomic grip and therefor easy to empty. The robust frame in the front is also easy to grap and allows easy transport e.g. over steps. The pushing handle is foldable and can be adjusted in three steps according to the size of the user. After using the machine you just fold down the pushing handle so you can store it space-saving in the upright parking position. 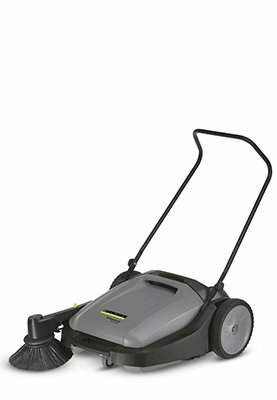 Beautiful formed push sweeper for cleaning small indoor and outdoor areas. Area performance up to 2800 m²/h. Little force to push and high agility. Dust-poor sweeping due to controlled air flow and dust filter. The main roller brush is driven via both wheels which leads to an outstanding sweeping result in right and left curves. The stepwise adjustable side brush allows an optimal adjustment to the floor and the sweeping objects. Space-saving storage and easy to transport due to the low weight.